In my work I court the impossible; I hold tight to a teetering edge. I am fascinated by what philosopher Drew Leder calls the null point—the place between—neither in nor out of the body’s acuity. I attempt to suspend time and extend the tipping point, the moment right before collapse, dangling, almost falling, almost overflowing. By reconfiguring the elements of setting, object and gesture, I create familiar scenes unsettlingly abstracted, evoking devotion, intimacy or longing. I find inspiration in my immediate surroundings: the place, its history, the people there and the remnants on hand. 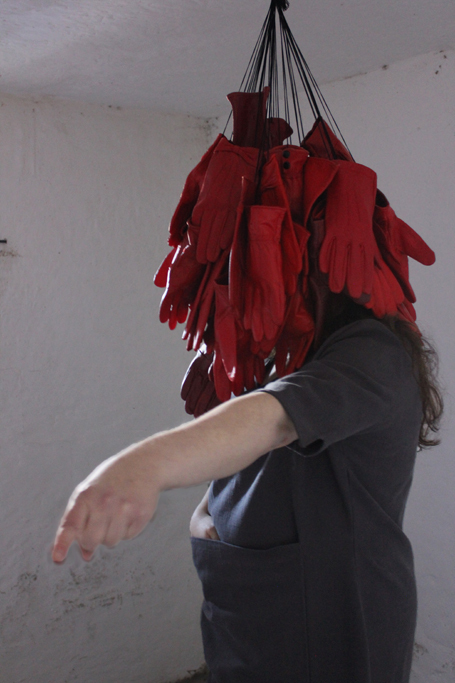 In durational performance, I employ mundane, seemingly ordinary things and common, repetitive tasks. Sculpting space and material to create heightened sites for routine but exacting gestures, I offer an image of a woman made just slightly larger-than-life, often weighted by or tethered to oversized sculptural garments, or within minimal found object installations. The transformation of the physical material, including the give of the fabric, the subtle shift of the piles, or the wilt of the body posture, serves as both motive and metaphor for the transformation of my internal state. Perhaps a type of archetype is invoked; the woman of the performance has a particular clarity of focus, on the task, on the circumstance, on the public, that is other than my own. I conjure a kind of quiet alchemy by imprinting the space, moment by moment, hour after hour, with simple, ceaseless effort: sifting, sewing, pointing, licking, kissing, laughing. In my work, in every way, I seek the magic of being made wholly vulnerable and inexorably connected.